Here comes the big trouble, for with floating of naira comes massive devaluation, Hyperinflation and higher interest rate. Nigerian government has finally bowed to recommendation by masterly International Monetary Fund (IMF) to devalue naira by allowing the embittered currency to float. Nigerian government cannot be accused of dithering; the government held his own but oddities and authoritative IMF finally have their way. The governor of Central Bank of Nigeria (CBN), Godwin Emefiele has stipulated that naira value will be determined by the forces of the market grounded on the law of demand and supply. Therefore from June 20, naira will be allowed to float, subsequently bringing with it massive devaluation and further weakening of naira. CBN has earlier pegged naira at about 197 to a dollar, but the apparent value of naira determined at the parallel market stood at about 340-350 to a dollar. When the pegged on naira is finally removed and floating commences, the outing prevailing naira rate at forex may climb up to 400 to dollar higher than the rate at parallel (black) market. The possibility and probability are imminent because there is not enough dollars to sell to ‘hungry’ buyers. The demand for dollars by the “selective dealers” will surge with inadequate supply, simultaneously deteriorating the intrinsic purchasing power of naira at the monetary base. The weakening and devalued naira will depressed the currency purchasing power due to the emerging hyperinflation. Take note of the word ‘hyperinflation’ this is not your ordinary inflationary trend. Hyperinflation can be describe as super inflation attributed to declining naira value, economic recession and paucity of food products/essential materials in the market. With consecutive negative contractions of two quarters, recession will be apparent. Already the GDP has a negative growth of 0.4 percent in the first quarter of the year. According to National Bureau of Statistics, the country’s inflation rate is at six year high of 15.6 percent but many economists are not seeing eye-to-eye on the accuracy of the given number. Prof. Stevie Hanke , the applied economist at Johns Hopkins University and director of the Troubled Currencies Project at Cato Institute disagreed with the given inflation rate. He professed that the discrepancy on the modus of the tabulation of Nigeria's inflation rate does not reflect the true reality of the higher inflationary trends. With prices of rice, garri and yam going beyond the reach of average Nigerian family. How do Obi, Dele and Bello feed their families? The floating of naira and its ramifications are not making things better at the foreseeable future. The astringent tightening tool of CBN’s monetary policy cannot tame hyperinflationary trend by the raising of interest rate. The reality is that the macroeconomics oddities and dislocations are beyond the application of the waned CBN’s monetary policy. The Nigeria’s interest rate at 13 percent is bound to be raised higher notch up by CBN to 14-15 percent to rein in the rising inflation. The move will spell more misery to Nigerian business community, for the subsequent mopping of liquidity will dry up credits and invariably makes borrowing more expensive in the illiquidity market. "Nigeria is in trouble," Steve Hanke, a professor of applied economics at Johns Hopkins, told CNBC in an interview. Amid double-digit inflation, Nigeria's foreign reserves are dwindling as the government races to shore up a swooning currency, the naira. The currency is junk and the government is incompetent and corrupt," said Johns Hopkins' Hanke. "The only sure-fire way to solve all these problems is for Nigeria to officially replace its junk currency." Pop quiz: Which oil rich economy hammered by the global slump in crude is in the throes of a full-fledged economic crisis — complete with rationing, civil strife and runaway inflation stoked by a weak currency? If you guessed Venezuela, you'd be wrong. Although the South American country teeters on the edge of collapse and fits the above scenario, those same circumstances actually apply to Nigeria. Once a powerhouse of West Africa's economy, the effects of slumping oil prices have converged with mounting security concerns and widespread energy shortages. The OPEC country, which produces more than 2 million barrels of oil per day, is resorting to rationing crude: In order to fill their tanks, citizens must endure long lines overseen by authorities. Nigeria "is caught in a macro hurricane," famed short seller James Chanos told the annual Sohn Investment Conference last week. With currency reserves running low, the country could have "a big problem" within a few years, he said. Calling the country "a borderline failed state," Chanos added that he was shorting South African assets, in part because of their exposure to Nigeria. In the year that Nigerians elected a new president, oil prices collapsed by at least 30 percent. This week, Nigeria's stock market staged a relief rally after the closely watched MSCI Frontier Markets Index decided to keep the country in the benchmark, after warning last month that Nigeria was at risk of being booted from the index. Still, the outlook for Africa's largest economy remains grim. The extremist group Boko Haram has created significant political and security challenges for the embattled government of Muhammadu Buhari, and raise risks that could hit oil production. Using a purchasing power parity metric, Hanke estimates that the country's prices are surging by a whopping 46 percent, far above the official rate of between 11 and 13 percent. Weak growth — Nigeria's economy expanded by less than 3 percent last year — has done little to curb soaring food prices, which have risen every month since December 2015. Meanwhile, oil prices remain firmly under $50 per barrel, heightening the risk of what consulting firm PricewaterhouseCoopers noted in a 2015 report could become a "security shock," as weak growth feeds political instability. Currently, the country's 2016 budget assumes an oil price of $38 per barrel. Razia Khan, chief economist for Africa at Standard Chartered, expects crude will rise later in the year, but growth is likely to remain muted. Khan noted that the International Monetary Fund "expects growth to decline even further in 2016, to 2.3 percent." Oil gives Nigeria around 95 percent of its foreign earnings. Should crude remain at current levels, PwC expects growth to contract and oil revenues to dwindle to $20 billion. Meanwhile, the currency has already overshot PwC's worst-case forecast for this year, blowing past 320 to the U.S. dollar recently. "The currency is junk and the government is incompetent and corrupt," said Johns Hopkins' Hanke. "The only sure-fire way to solve all these problems is for Nigeria to officially replace its junk currency." Nigeria still has limited access to capital markets, and a $6 billion currency swap agreement with China may help contain the naira's losses. Yet with oil still hovering near historic lows, analysts are skeptical Nigeria will see a turnaround anytime soon. "Following a tumultuous year for the naira in 2015 we believe the any recovery in the currency will have to be supported by a marked improvement in the crude oil price," Standard Chartered's Khan said, adding that oil would need to rise to near $55 to offset the effects of an "oversupplied market." — CNBC's Dawn Giel contributed to this article. As crude oil price continues to nosedive and with limited war chest to shield naira, the Central Bank of Nigeria (CBN) has officially devalued naira by 8 percent and raised interest rates by 100 basis points. Godwin Emefiele, the CBN governor and the delegated chair of Nigeria’s Reserve apex bank announced the development in Abuja after the emergence meeting with the members of the Monetary Policy Committee. With this devaluation naira will be pegged at the exchange rate of N168 compared to the previous rate of N155 to one U.S. dollar, which will hinged on the target band of naira between 160-176 to the US dollar, compared with the previously 150-160 naira to the US dollar. The interest rate was raised by 100 points from previously 12 percent to 13 percent in order to checkmate anticipated emerging inflation, deter currency speculation and to restrict capital flight from the financial market. The recent arrangement will possibly tame, if not slow the bleeding of the foreign reserve used in the defending of naira. Nigeria with a limited resources and a foreign reserve that stood at previously $39.5 billion could not afford to defend naira indefinitely from the aggressive currency speculators as price of oil continues to slide. Nigeria just have to say no to fabricating a bulwark to protect weaken naira due to its inability to replenish its reserve as oil price continues to nosedive. It is an expensive venture and not sustainable to vend off naira from the volatile oil price and currency speculators with the country’s relatively light-weight foreign reserve. The country’s dependency on oil for its majority of foreign exchange reserve has buttressed the weakness of Nigeria’s standing on its macroeconomics stability. The country’s GDP show an emerging diversity but it cannot be said of her accumulation of foreign reserve which relies mostly on the export of crude oil. The hard reality is that the country’s foreign exchange is chiefly derived from oil revenues. And oil accounts for almost 80 percent of the foreign revenue and this must change if a stable value of naira is to be maintained and sustained. The herculean task for the policy makers and the government is to find ways to supplement crude oil export with arrays of meaningful exports of goods and services to offshoot the slavishly dependence on oil. The new interest rate at 13 percent cannot be the panacea to the problems of macroeconomics stability especially the problem of inflation. At the interim the country’s inflation rate is below 10 percent but at the consumer level the inflationary trends appears more ambiguous and detrimental in basic business transaction where naira could hardly buys anything of substance that can be affordable to average Nigerian. Again the upward arrangement of higher interest rate may discourage borrowing at the monetary base, thus making it more difficult for small and medium business communities to borrow and invest in their businesses. With the declining price of oil the subsequent tightening of belt will emerged. But one thing Nigeria cannot afford to do is to abandon her investments on country’s decaying infrastructures especially the provision of electric energy, roads and drinking water. The most important job of a given government is the protection of life and property. Stable and peaceful societies are the foundation for a prosperous society that has the propensity to attract and sustain investments. By doing well and administering the right vision the problems of macroeconomics can be corrected with logical monetary and fiscal policies. Naira the fickle currency of Nigeria is quite sensitive to the depressing oil price in the international market. Nigeria receives 75-80 percent of her foreign exchange from the export of crude oil. So once there are any negative changes or disruptions in the price of oil, it does adversely affect Naira and thereby reduces the quantity of foreign exchange accumulated by Nigeria. The nosedive of oil price has the propensity to weaken naira and will induce the Central Bank of Nigeria (CBN) to prop it up with its limited war chest at its disposal. The weaken naira may trigger inflationary trends that may compel the CBN to increase the interest rate. At the interim, interest rate stood at 12 percent and further increase may make it more cumbersome for small and medium business community to borrow from financial institutions. With increasing oil production by United States and the creping oil glut in the market. And together with the decreasing importation of crude oil by America, Nigeria and its naira are beginning to feel the pain where it counts especially on its budget and value of its currency. The naira could not withstand the price nose-diving of oil and has become to depreciate in face to face confrontation with the dominant US dollar. But Nigeria is without exception, other major oil producing countries including Russia, Norway. Canada, Ghana and others are seeing their currencies hit by the overflowing oil production in the market. “The naira’s drop placed Nigeria among the oil-rich nations hardest hit by a production glut that has prompted a 28% drop in Brent crude prices from their 2014 high hit in June. The ruble also has caused headaches for the Russian central bank, while the Norwegian krone and Canadian dollar also have dropped. Oil and natural gas account for 96% of export revenue in Nigeria and about 80% of government revenue, according to the International Monetary Fund,” as reported by Wall Street Journal showed that oil glut is becoming a threat to oil producing currencies especially those that dependent mostly on oil export for its foreign exchange. Nigeria’s apex bank, Central Bank of Nigeria (CBN) is now in a mood of fighting to defend and fend off the stumbling and weakening naira from aggressive and hostile speculators. But how long can CBN be in the fight before she concedes and throws in her towel. To be realistic, the battle to prop up and circumvent naira is quite expensive and Nigeria’s war chest is relatively minuscule. Nigeria foreign reserve stood at $39.5 billion compared to Russia's $454 billion, therefore Nigeria’s arm for struggle is not long enough to take on dollar for a quantifiable duration. "Nigeria has done the best she can do for now to up hold the naira’s value and the country’s “ central bank stepped in Friday to buy the currency after the U.S. dollar shot up to more than 172 naira, traders said, marking an all-time low for the Nigerian currency. The move lower is being driven by concerns that tumbling oil prices would hit Africa’s biggest economy hard. Nigeria is Africa’s top oil producer. Late Friday in New York, the naira recovered to 166.180 against the dollar, compared with 170.215 naira late Thursday", as was revealed by Wall Street Journal. Although, Nigeria has done a good job in the diversification of her gross national product. It has shown after the country’s rebasing of her economy that the previously unacknowledged sectors of the economy were vibrantly emerging especially the entertainment industry popularly known as Nollywood that has its own share of gdp at 1.4 percent. Nigerian Gross Domestic Product (GDP) that was rebased “by the National Bureau of Statistic has underscored the decline in the contribution of the oil and gas industry to the GDP in recent times. Before the rebasing, the share of crude oil and natural gas to the nominal GDP was 40.86 percent in 2011, 37.01 percent in 2012 and 32.43 percent in 2013. According to the rebased figures, the share has declined to 17.52 percent, 15.89 percent and 14.40 percent for 2011, 2012 and 2013 respectively", as delineated by Business Day. But the hard reality is that country’s foreign exchange is chiefly derived from oil revenues. And oil accounts for almost 80 percent of the foreign revenue and this must change if a stable value of naira is to be maintained and sustained. Agriculture and Nollywood must be brought to bear for a greater share of country’s foreign exchange to be stabilized. It is not going to be an easy task to make those two sectors of the economy - Agriculture and Entertainment in competition with oil as regards to generating more foreign revenues. To make it possible, Nigeria must employed what I denote as ‘isolation-derived foreign exchange’, whereby Nigeria will concentrate in massive production and enhancement of a particular crop that can bring more foreign exchange than others. Nollywood has not been given the attention it desperately deserves, because Nigeria is making ease money from the export of oil. Take for instance United States of America makes its second highest revenue from exporting its Hollywood to the rest of the world. Nigerian government can aid Nollywood to market its movies and music abroad by protecting the intellectual property and copyright. Nollywood can garner a sizable foreign exchange when its distribution channels and services are properly delivered and protected by intellectual property laws. Naira can be protected and enhanced when sources of foreign revenues are diversified beyond oil. With Nigeria's limited resources it becomes a futile task to vend off speculators especially at this time the price of oil is floundering. The country’s war chest in not sufficient and sustainable to rebuild naira, thus becoming a herculean task to keep its value stable when oil is the only major source of foreign exchange. Naira’s sensitivity to the gyrating price, supply and demand of oil will continue until Nigeria diversifies her foreign exchange, a machination that will permanently put naira in a safe and fortified bunker. Naira is falling but why? Naira the currency of Nigeria that has been known for a while for its stability has experienced a level of weakest that injected a little panic at Forex market and Central Bank of Nigeria. The quick depreciation of naira must be a headache to the Nigerian financial policy makers at Central Bank of Nigeria (CBN) that wasted no time in reassuring the market that Nigeria has an adequate war chest to defend naira from aggressive speculators. At the last session of Forex market naira was traded at around 164.50 and lately at 161.85 against US dollar. For the record naira has maintained stability at a level hovering around 155-160 against US dollar. Therefore the concern is real and currency warriors at Central Bank of Nigeria are already to fight back and defend naira. Yes, Charlie Robertson is probably right, but the anticipating 5-10 percent depreciation may be too much. Somewhere at about 2-3 percent depreciation is reasonable but that is not going to occur and happen because Central Bank of Nigeria will not give into it nor is Nigeria willing to allow naira to slip into such a weakened currency. One thing going for Central Bank of Nigeria is the moderately accumulated foreign reserve which stood at $42 billion. The deputy governor of central Bank of Nigeria Sarah Alade was emboldened in reminding the speculators and currency traders that Nigeria has the means and courage to intervene on behalf of naira. Such a statement coming from deputy governor of central Bank of Nigeria Sarah Alade may psychologically impact the market positively and scare away speculators that will realize that Nigeria is ready to intervene if the need be so. Naira may be attracting currency speculators for many reasons including for good and bad reasons. On a lighter side Nigeria’s naira has the world looking at it more positively because Nigeria has been recognized as a strong emerging market. In addition, the country’s financial house and fundamentals are relatively stable including its macroeconomics. The downside maybe that currency speculators probably feel some signs of weakness and they move in. But Nigeria with $42 billion in foreign reserve can adequately fend them off and defend naira. The last thing Nigeria would do at the moment is to devalue naira because Central Bank of Nigeria may hold the view that it is too expensive to defend naira. But devaluation of naira will send a wrong message to our trading partners and may even trigger a currency war. Judging from the reaction and reassuring statement coming from Central Bank of Nigeria that is far fetch. Beyond its cosmetics largess and intimidating attribute, strong foreign reserve plays a fundamental role in the stabilization of a nation’s currency. In case of Nigeria, the country’s currency which is naira must be stabilized for a healthy and thriving economy to be sustainable. Naira’s stabilization can be functionally achieved when a reasonable accumulation of foreign reserve is met and sustain. At the interim, Nigeria foreign reserve stood at $47 billion; with naira increasingly stability and rising oil price, the erstwhile depleting external reserve fund have been replenished. In September 2008 the foreign reserve was $62 billion and it was propelled solely by high price of oil. But now the stabilization of naira is coming into a play, thus aiding in propping up the reserve by bolstering strong confidence in the investors, thereby attracting portfolio investments. 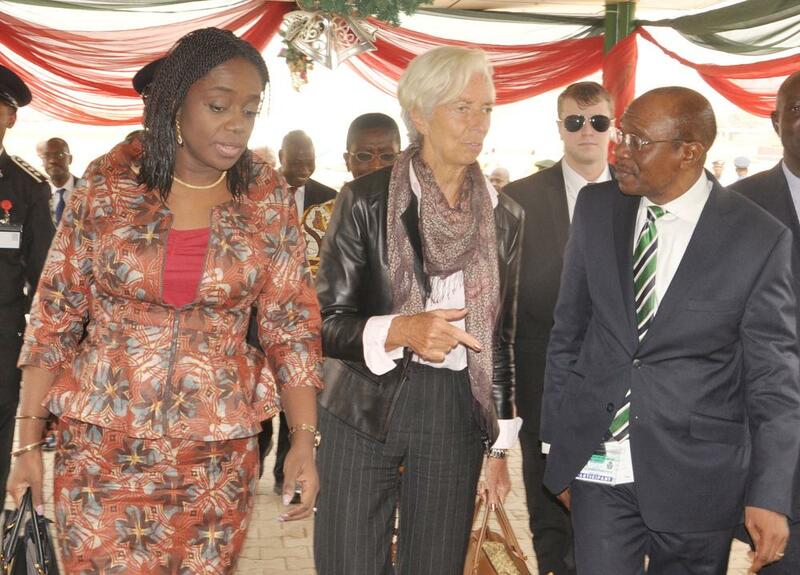 The role of naira stability must be treasured for contributing to the appreciation of the foreign reserve. Sound macro-economic stability, essentially the stable naira has open door to inflow of investments especially in the capital market. Many Nigerians including many high ranking politicians are lately questioning the reason for the accumulation of relatively large foreign reserve by Nigerian government, which was engineered by the country’s financial policy makers. Therefore it makes ample sense that the role of foreign reserve must be readily made available to all Nigerians who are eager to understand how it works. The policy makers at executive branch and at country’s apex bank have not done a good job in communicating to stakeholders – the masses of Nigerians who are surviving with less than $2 a day while country is maintaining a large foreign reserve. Naira must be protected from fierce and perilous world of currency trading especially from hostile speculators that are bent on making their ‘kill’ without being considerate on the detrimental side effects of their actions. A strong foreign reserve becomes a bulwark to speculators who will be intimidated by large foreign reserve of a nation. Strong foreign reserve becomes a powerful tool for adjustment of the exchange rate when it deems necessary with regards to the international trade and payments. Foreign exchange reserve can be used to stimulate export and depressed importation. An export orientated nation with arrays of products to export does not want a very high valued or overvalued currency that may make their products expensive for foreign buyers. In this case, the country will tap into her reserve and buy foreign notes that will lessen the value of her currency. But to discourage importation, the strong reserve comes into handy too, by buying up local notes that will make imported goods expensive and increased the value of the local currency. An ample foreign reserve gives a sense of power and security for a nation to be able to manipulate is exchange rate and value at its will and when she deems it necessary. At the macroeconomics level, a strong foreign reserve is quite significant. When it comes to quantity of international trade and commerce; the regulation of inflation and employment with desirable outcomes could become realizable with strong foreign reserve in the hands of good managers. United States of America has been complaining that China is manipulating her currency for her own maximum benefit. American politicians and policy makers are concerned about China’s relatively weaken currency that made it possible for China’s products to be cheaper to buy, simultaneously making it more expensive for local Chinese consumers to buy foreign products. China per say is not doing anything illegal but they are rather tapping into their incredible mind-blowing foreign reserve that may be up to three trillion dollars. With such an enormous and large foreign reserve, one can correctly say that China is manipulating its currency but she is not breaking any laws. China is playing the game to beneficent of her economy. The big problem in this case may be the potential invitation of trade and currency war, such a scenario will not be a welcomed development for the global trade because everybody will be a loser. As the governor of Central Bank of Nigeria acknowledged, "We need to go into a period of strong and serious fiscal restraints and consolidation. We must continue to build up external reserves and protect the economy from external shocks and focus on the strength and resilience of the banking system. We are building buffers for the economy in the event of external shocks." That is a well taken point because Nigeria is still a chiefly one commodity based economy. Nigeria’s majority of foreign reserve comes from oil export and a sudden drop in the price of oil will greatly affect the economy and reduce the reserve. It is therefore logical and necessary for building up of reserve to continue, for nobody knows how long the price of oil will stay up. Nigeria without diversity of the economy is still hanging by the thread whenever the price of oil nosedives. Nigeria’s quest to become a major industrial economy by 2020 or 2030 requires a sound macroeconomics. Therefore the importance of an enabling foreign reserve cannot be overemphasized. A strong economy is an economy that has the financial and economic tools needed to set its agenda, bring it to fruition and to be sustainable on a global scale despite competition. Therefore in today’s Nigeria and in the future, a strong foreign reserve is inevitable. We all wake up one bright morning; the next thing we heard was that Sanusi’s Central bank of Nigeria (CBN) will introduce a 5,000 naira banknote in the circulation in nearest future. The most perplexing question that begs for an answer is when and why CBN arrive to this decision to print such a large denomination without adequate consultation and research analysis. Although CBN is an autonomous institution, it still own certain explanation to Nigerians on the strategic importance and impacts of its decision and on how the country can benefit from it. Sanusi’s CBN have for a while been worried about the increasing inflationary trend in the economy. To that effect the country’s reserve bank has gone about it by raising the interest rate to more 12 percent to combat rising inflation. Now in a split of second they chose to rubbish their good work with this incoherent policy decision. By printing a large denomination of naira notes, the value of the naira will nosedive while inflation will gain momentum and that can be disastrous to the economy. Sometimes, our policy makers especially those of them that are making important financial decisions act like those that do not grasp the fundamentals of monetary and macro economic theories. One cannot quench a burning fire by throwing kerosene into it. How can you tame inflation by application of tools that will make it worse than before? I am totally disappointed with Central Bank of Nigeria. Does Nigeria desire to make naira become worthless akin to Zimbabwe currency that is miserably worthless? Is Nigeria policymakers ever ‘chill out’ and think critically on how their decisions may destroy the house they are trying to build. These impulsive financial and monetary decisions were what wrecked the economy of Zimbabwe. Nigeria is tilting to the path of Zimbabwe economic gulag where hyperinflation and incoherent economic decision will doom the nation’s economy. It may be incredulous to believe but it was in a record that Zimbabwe printed the largest banknote denomination of 1oo trillion dollar bill. Zimbabwe with its fool’s decision demolished their agricultural based economy with massive inflation. And restored to printing large banknotes to control inflation which made worst of the situation. Nigeria has everything going for it in terms of steady influx of foreign exchange it derived from the continuous sale of oil. Even with that phenomena naira is still soft and malleable when compared to other similar economies of Nigeria’s standard. Most of country‘s problems from their quick and unsound decisions that comes from their political and policy makers come from the country’s supposedly best and brightest who should have known better. Emeka Chiakwelu, Analyst and Principal Policy Strategist at Afripol Organization. THE Senate, yesterday, warned the Governor of Central Bank of Nigeria, CBN, Mallam Sanusi Lamido Sanusi, to, as a matter of urgency, stop his proposed introduction of N5,000 denomination. Addressing journalists in Abuja, Chairman, Senate Committee on Banking, Insurance and other Financial Institutions, Senator Bassey Edet Otu, said that it had become imperative for Senate to put a halt to the new CBN arrangement because a project of this kind required parliamentary approval, adding that the upper legislative chamber was never briefed prior to the announcement of the soon-to-be introduced note. "As a committee, we should do our work. This morning there is a burning issue that is going on in our country and there is need for us, as a committee, to comment on this topical issue. I am the chairman of the Senate Committee on Banking, Currency and other financial institutions. "We have also read in the papers just like you about the currency restructuring that the CBN embarked on. I believe that a project of this nature requires parliamentary approval because there are numerous and fiscal implications on the entire economy," Senator Otu said. The CBN governor had on Thursday, last week, announced the introduction of a new currency series where the existing denominations of N50, N100, N200, N500 and N1,000 will be redesigned and a new note of N5,000 introduced. According to Sanusi, the front face of the new highest denomination will be adorned with the pictures of three women activists - late Margaret Ekpo, Funmilayo Kuti and Hajiya Gambo Sawaba, while the back side would have the National Assembly structure. Speaking further, Senator Otu warned the CBN to be very careful in taking some decisions that would worsen the nation's economy and send wrong signal that Nigeria's currency was valueless. He stressed that the country did not deserve this policy since the nation was not in a major crisis. According to him, "this type of action is only taken where there is a major crisis and the CBN must be very careful in order not to send a wrong signal or message to households, domestic sector and even the external ones that the Nigerian currency is valueless, which I believe it is definitely not, and that for every unit of value they need to carry a large quantity of cash. "The CBN in 2008 and 2009 came up with a proposal to re-denominate the currency, that was even to take off the zeroes. This was just 2008 and 2009 and here we are in 2012 we are seeing a kind of policy somersault even though we understand the dynamics of the sector very well. I believe that we have to be well briefed on this. "Also in 2005, the CBN undertook a major currency restructuring which ran into billions of Naira. "Till date, a proper value has not been done to know its costs to the Nigerian tax payers and the extent of the benefits and in that 2005 coinage, I think it did not work at all because both the goldsmiths and the blacksmiths converted the coins to moulding bangles, earrings, etc. "So, we believe that the coinage works very well where there is infrastructure to take it like a half, probably like a parking where you go and put it, etc. We have not developed that real basic infrastructure and those coins, most of them, are nowhere really to be found. "The CBN will have to prove that the policy is not a clear contradiction or at variance with cashless society, which they are even yet to justify and whether this is the popular economic way to go. We are asking and we are sending a letter to them to stop all further actions on this until the senate of the Federal Republic is properly briefed." Asked if the CBN informed the Senate prior to the decision, Senator Otu said: "Well, we have not been properly briefed yet, so I would not know. We do not know the reason for it, even though at the moment we do know that inflation is a problem, but I don't think that they have used all the mechanisms to tackle it and it is not really out of hands. "There has not been any meeting with the CBN yet. This is a major policy issue and there is no way this kind of thing can go on without us knowing everything about the details in order to know how it will affect the people of Nigeria." On what section of the constitution the Senate was relying on, he said: "We are not really going to rely on laws per se, what we are trying to do here is what is best for the Nigerian people. The Senate is not really against the independence of the CBN, but what we want in place is proper check and that there should be checks and balances in all these things that we do. "So, I believe that at some point we will be able to sit down together and look at the merits and demerits, but till date we do not know anything about it and we do not know what the people stand to gain and until that is properly put through, we say everything about it must stop." The appreciation of naira is due to relative mass inflow of dollars into the exchange market. Due to dollar sales by oil companies and Central Bank of Nigeria the Nair's buoyancy is likely to continue expect fiscal expenditure and monetary interruptions. The conditional naira's appreciation is tactical move that lacks elongated strategic planning. Naira value should rest on a sound economic outlook and economic output not on temporary fix as inflow of dollar suggested. When the Federal government of Nigeria's over blotted budget kicks in and the price of oil comes down, it will affect the rising value of naira. The partial removal of subsidies may be aiding the value of naira as a source to replenish reserve but the possibility of disturbance have not been put to rest as the government continues to negotiate with the restive labour. The scope and sources of inflow of foreign exchange into the market must be expanded and that is possible when the economy have arrays of products to export in order to generate ample foreign exchange. The limited source of dollar from oil export cannot do the trick and the economy with its structural imbalance cannot sustain the appreciating naira. Therefore naira has not arrived home safe nor is it possible to refer to naira as a strong currency. Bloomberg reported that "The currency of Africa’s biggest oil producer appreciated 0.2 percent to 157.9 per dollar as of 10:27 a.m. in Lagos, the commercial capital, rising 0.6 percent this week. A close at this level would be the highest since Nov. 8, according to data compiled by Bloomberg." 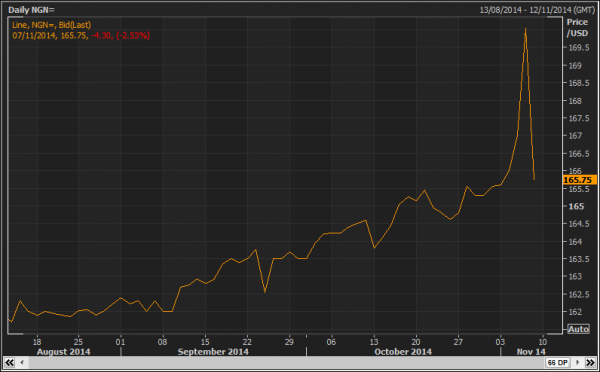 This latest appreciation may not be an indication that the good days for naira is back again. The gaining by naira is not anchored on strong fundamentals of Nigeria's economy but rather on the momentum engineered by sales of dollar by the oil companies and the country's Federal Reserve Bank, Central Bank of Nigeria (CBN). "Nigeria has sold $600 million at two foreign-currency auctions this week, the largest amount sold in five days by the central bank since October. The bank offers dollars at twice- weekly auctions to maintain exchange rate stability. The oil industry is the next major source of dollar supply to lenders after the central bank," according to report coming from Bloomberg. Speaking on enhancing the value of naira, Emeka Chiakwelu, Principal Policy Strategist at Afripol emphasized that sustaining naira's appreciation must follow an unambiguous standard of operation and pathway methodology that will make a real difference on the value of naira. Chiakwelu restated that, "The country's reserve stood at US$ 32.64 billion in December and the inability to replenish the dwindling reserve in spite of high price of oil was due to the constant defense of the weaken naira." And he further stated : “To enhance the value of naira the country's war chest must be strengthened in order to withstand the threat coming from speculators. The CBN has eventually restored to the devaluation of naira up to N160 to $1. But the bulwark is not the panacea because it is focusing on the symptoms of the problem not on the root cause. The country does not produce arrays of agricultural and finished products to export in order to raise a quantifiable foreign exchange that can make naira stronger and that can discourage currency speculators." The problem with Sanusi's Central Bank of Nigeria (CBN) is not coming in tune with the big picture but rather embracing piecemeal methods to fix naira. There must be a long term and comprehensive planning that will bring together the executive, legislature and CBN together. The appreciating naira in three weeks sounds good but to bring about a strong naira that is sustainable needs more work. The fiscal and monetary policies should be in tune with one another and more importantly a strong currency is a reflection of a country's economic wellbeing. The midpoint of the naira target band was lowered to 155 per dollar from 150, Governor Lamido Sanusi told reporters in the capital, Abuja, yesterday. The benchmark interest rate was left at a record 12 percent. The Central Bank of Nigeria had raised its key rate at every meeting this year until yesterday, boosting it by 2.75 percentage points on Oct. 10 as inflation pressures mounted. Slower economic growth in Africa’s most populous nation and concern that oil prices may decline as the global recovery wanes gives Sanusi room to keep borrowing costs on hold. Nigeria’s economic growth slowed to 7.4 percent in the third quarter from 7.7 percent in the previous three months as oil output eased, the statistics office said on Nov. 15. The price of oil plunged 13 percent in New York in the first nine months of the year. “We need to be very careful about how much tightening is too much and how much tightening is too fast,” Sanusi said. Interest rates have been increased this year as inflation climbed above the central bank’s 10 percent target. Consumer prices rose 10.5 percent in October, up from 10.3 percent in the previous month, according to the statistics office. Price pressures may increase next year as Nigeria prepares to remove a subsidy on fuel that costs the government $7.5 billion a year. The central bank will act to contain any “second-round” impact on inflation from the price shock, Sanusi said. The central bank, which manages the exchange rate by selling foreign currency at twice-weekly auctions, has been struggling to keep the naira at its official target of 3 points above or below 150 per dollar. The rate at yesterday’s auction weakened to 155.21 naira per dollar. The naira fell 0.3 percent to 159.325 per dollar on the interbank market as of 9:16 a.m. in Lagos today.